Decorating with Egg Cups | What about this? To justify collecting “stuff,” I try to think of as many ways as possible to use my collections. 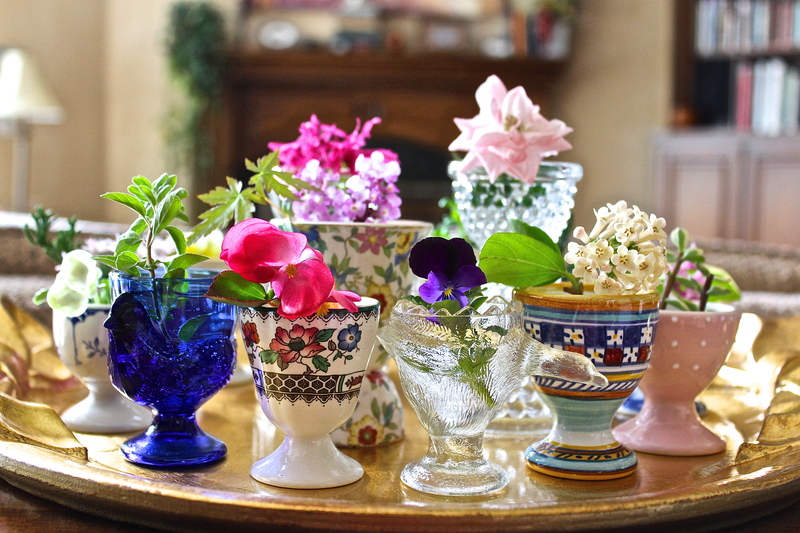 For example, every March and April, I use my eclectic collection of egg cups to bring spring joy to my home. I fill them with sweet treats, flowers, or candles and use them as decorations. If you don’t already have a collection of egg cups and you’d like to start one, now is the time to start looking! Egg cups are normally inexpensive, unless you buy rare antique ones. Most of mine were treasures found at peddlers’ fairs, flea markets, antique stores, import stores, department stores, and discount stores, such as Tuesday Morning, T.J. Maxx, and Marshall’s. If you have any ideas or suggestions on other creative ways to use egg cups, I’d love to hear about them! Whether you use egg cups that match your china or you use a variety of egg cups, they are the perfect size to fill with sweet treats for your guests. Don’t feel restricted to filling them with jelly beans – a single chocolate truffle would add elegance to your table! Start by spreading a small amount of paper grass on a platter, tray, or serving dish. 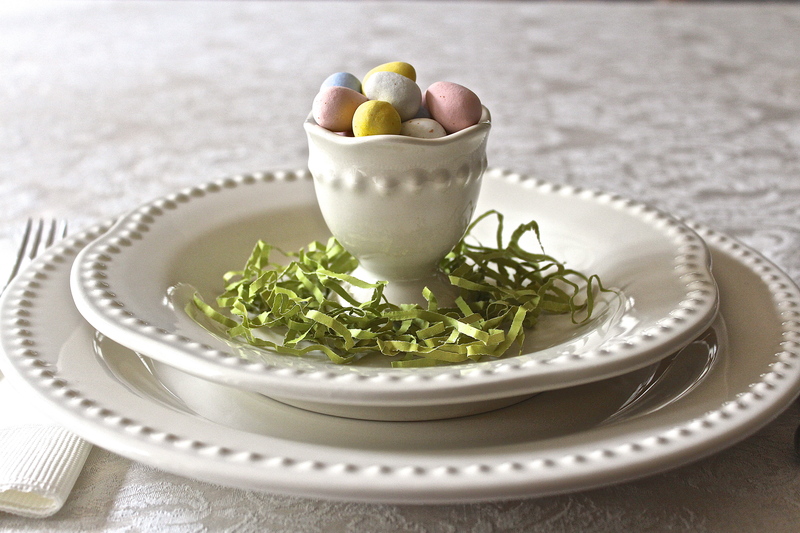 Arrange your egg cups on the platter, trying to vary the heights and colors of the cups. 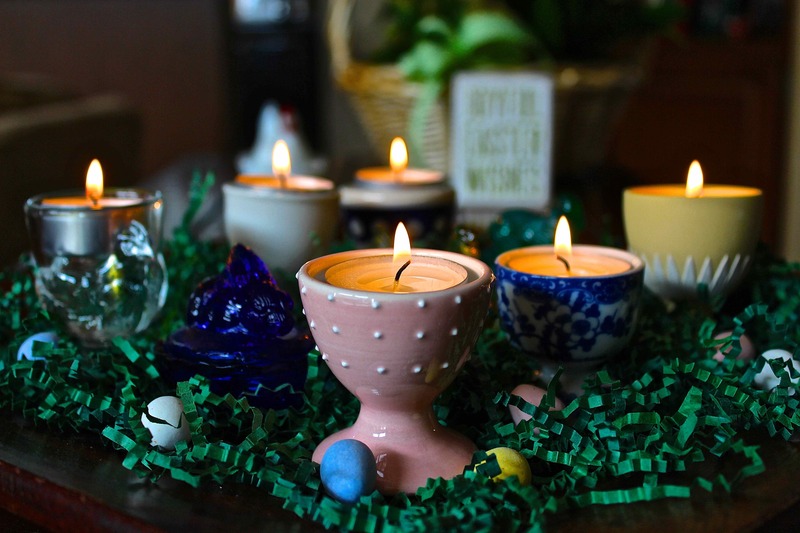 Put tea lights inside each of the egg cups. If desired, sprinkle Easter egg candy on the grass around the egg cups. I particularly like Cadbury’s Mini Eggs! This is my favorite way to use my collection of egg cups. After arranging the egg cups on a tray, again placing the taller ones in the center and surrounding those with shorter ones, I use a measuring cup to fill them with water. Then I go out into my yard and look for small flowers and little bits of greenery. I try to keep the flowers and greens to scale with the size of my egg cups. Obviously, putting a camellia blossom inside an egg cup wouldn’t work, because the blossom would topple over. Most herbs work well in this case, because they have small leaves. Decorating with egg cups is eggs-tremely fun! 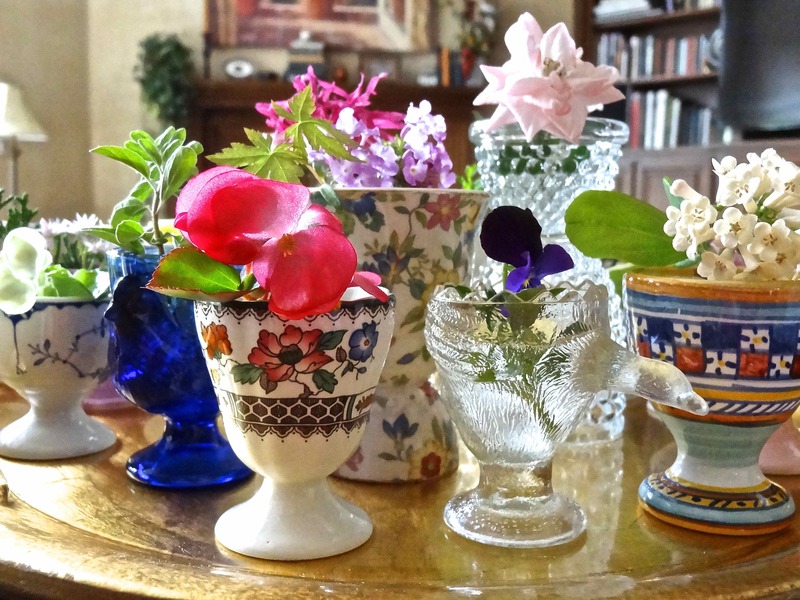 I also have a small collection of egg cups, and enjoy making tiny flower arrangements in them. Thanks for the idea of filling with treats for guests.